Let me tell you about a very special person. This message is about my friend Tom Nunnally who in the month of October moved beyond the struggles of life on earth for a better place. I am sure as Carolyn, Tom’s wife wrote in a message to me. Tom will hear the words. Tom was first and foremost a child of God. He lived his life serving the Lord and serving his fellow man. I did not know Tom in his early years. Our relationship covered the last 10 years of his life. In those 10 years he became my friend and a friend to Urukundo and it’s children. Tom was a dedicated Rotarian and an advocate of pure water for everyone. The gift of 10 rain harvesting Tanks, reservoirs and Solar Pumps to supply fresh pure water to our community of over 3000 and our school is evidence of his dedication to the water project. His gifts to Hope Made Real for Urukundo were given in the name of Rotary. Tom did not seek glory or credit. 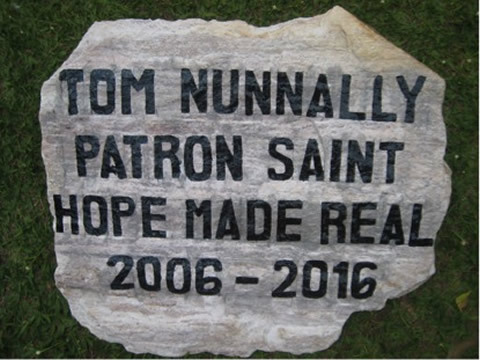 This stone honoring Tom’s memory is in the garden of our school. Tom served on the International Board of Directors of Hope Made Real, first as financial advisor and then as Vice President. He was a visionary and fit well the program of this ministry. His visit with the children in September 2014 was amazing. The children loved him. There were not enough seats beside Tom and it was a debate who would hold his hand walking to school each morning. He just did not have enough hands. Tom was the perfect grandfather figure for our kids. He was so loved by all the children and staff. I want to share with you what the children and I shared at devotions the evening Tom’s soul departed this earth. Our children knew Tom had fallen and was in the hospital and were praying for him to be well. The first question asked me when I joined the children that evening was. My answer was “yes, children Tom is ok”. Last evening, we prayed for God to take care of Tom. Sometimes God does not answer our prayers as we would like but we trust God and God answered our prayer by saying Tom should suffer no more. I will take him to me and he will not be sick ever again. Because God is good and loves him. Tom is well now and that is what we prayed for. So God answered our prayer. It is ok to be a bit sad but we must celebrate for Tom and the joy he now has. I asked the children. What was the best thing Tom taught us when he visited Urukundo? In unison the children said  “He taught us a song. Lets sing that song for Tom now". They raised their voices and sang. Zippy Do Da Zippy De ah  My oh my what a wonderful day. Plenty of Sunshine coming my way. Wonderful feeling wonderful day. This was Tom’s philosophy in life and every day was special to him. I am so glad he was in my life and the life of the children at Urukundo.